BACKGROUND: Cardiovascular disease contributes substantially to the non-communicable disease (NCD) burden in low-income and middle-income countries, which also often have substantial health personnel shortages. 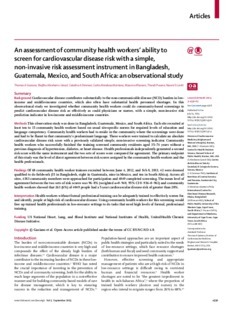 In this observational study we investigated whether community health workers could do community-based screenings to predict cardiovascular disease risk as effectively as could physicians or nurses, with a simple, non-invasive risk prediction indicator in low-income and middle-income countries. METHODS: This observation study was done in Bangladesh, Guatemala, Mexico, and South Africa. Each site recruited at least ten to 15 community health workers based on usual site-specific norms for required levels of education and language competency. Community health workers had to reside in the community where the screenings were done and had to be fluent in that community's predominant language. These workers were trained to calculate an absolute cardiovascular disease risk score with a previously validated simple, non-invasive screening indicator. Community health workers who successfully finished the training screened community residents aged 35-74 years without a previous diagnosis of hypertension, diabetes, or heart disease. Health professionals independently generated a second risk score with the same instrument and the two sets of scores were compared for agreement. The primary endpoint of this study was the level of direct agreement between risk scores assigned by the community health workers and the health professionals. 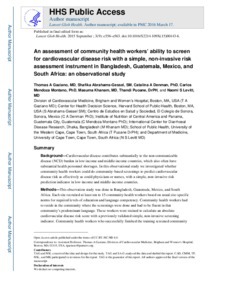 FINDINGS: Of 68 community health worker trainees recruited between June 4, 2012, and Feb 8, 2013, 42 were deemed qualified to do fieldwork (15 in Bangladesh, eight in Guatemala, nine in Mexico, and ten in South Africa). Across all sites, 4383 community members were approached for participation and 4049 completed screening. The mean level of agreement between the two sets of risk scores was 96� (weighted κ=0�8, 95% CI 0�6-0�1) and community health workers showed that 263 (6%) of 4049 people had a 5-year cardiovascular disease risk of greater than 20%. INTERPRETATION: Health workers without formal professional training can be adequately trained to effectively screen for, and identify, people at high risk of cardiovascular disease. Using community health workers for this screening would free up trained health professionals in low-resource settings to do tasks that need high levels of formal, professional training.